Tom, Rage and all who follow. Either this puzzle was harder than usual or my head cold is effecting my brain as well as my nose! all, whether you follow or not. Good Maen, good people. I showed up an hour too early at the hospital to check in for my surgery, so I have time for a few puzzles while my stomach growls. The waiting area smells of coffee and popcorn. I, of course, can't eat or drink anything. I'd give you a puzzle hack and a hug, Shiela, but I didn't see a clever numerical order for solving Easy today. And I've been trying my hardest to avoid catching any sort of a headcold or flu that will make my recovery harder. I'll send a instead. Get well soon. ow, Plum, what are you in for? Sorry Plum. I think I've been infected with DorA's orange side. While you are in there could you ask the docs if they have a cure for this terrible affliction. Hope all goes well, Plum! Will be thinking of you today. Sending prayers for a successful surgery and a quick, uneventful recovery. 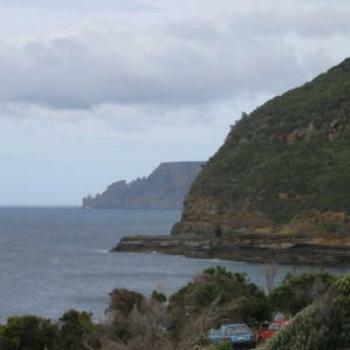 Beautiful place Tasmania, coastline included. all.It's a little chilly here in mid Florida. There have been frost warnings for the last 2 nights, just north of us. No snow or ice however! Best wishes for a successful procedure and a quick recovery Plum. b‍eehive - sent you a pm. To which ''affliction'' are you referring, beehive? ''Sudokuholicism''? Morning all,loved our visit to Tasmania. Good luck Plum, hope you are in recovery by now. A link to detailed info on Australia's Heat and Fire season, for those who are interested. Thanks, DoA - that was a very detailed report! I finally shed the dizziness of the anesthesia. I would have been sent home within a couple hours after surgery but I'm finally putting my foot down and insisting that I be able to walk safely before I'm released. I want no further knee and back injuries, thank you. Sleep apnea surgery: UPPP and tonsillectomy. The surgery is infamous for its renown as 'the most painful to recover from.' I'm willing to believe it. Beehive, I think it's a plot with wide ranging support to try to shut me up for a while. Sadly, with the pain in my throat the IV in the crook of my elbow that sets off an alarm when I pull my arm close enough to type on my phone screen, plus the pain med and anesthesia after effects still casting me into frequent sleep mode, the plot seems to be working -- for now. Jeez, I hope they give you guarantees with that Plum and I hope you recover soon. DorA, in answer to your question, 'Sudokuholicism' of course! Why on earth would I want to be cured of having a dark side! Doc says he'll be happy to do what he can. There's an empty hospital bed with your name on it. Glad you got 33. I'm not allowed alcohol and I'm presently limited to ice water and cold juices. Damn! I was hoping I could just take a pill or something. But...if its a frontal lobotomy I need, who am I to argue with the medical profession?